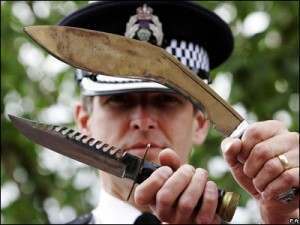 Youngsters will be urged to email tip-offs on classmates carrying knives to the police in an initiative starting today. The new warning service comes via the Crimestoppers’ youth website www.shadowcs.co.uk and will allow them to keep their identity secret. What you do is text or call the police and tell them who is carrying a knife. Be precise. Give an address. The developments are a victory for the Mirror’s Stop Knives, Save Lives campaign. Indeed. And an even better way to play a trick on someone! In other knife news, the Sun spots the album cover of US duo Gnarls Barkley. The cover of the Who’s Gonna save My Soul CD bears the image of a knife.